English physician and philanthropist; born Oct. 8, 1821; died in London Sept. 29, 1898. Davis was one of the earliest English Jews trained for the medical profession. He was educated at King's College, London, where he had a distinguished medical career, gaining the first prize in medicine and clinical surgery, and filling several residential positions in the King's College Hospital. In 1887 he was placed on the commission of the peace for the county of Middlesex, and became justice of the peace for the new county of London. 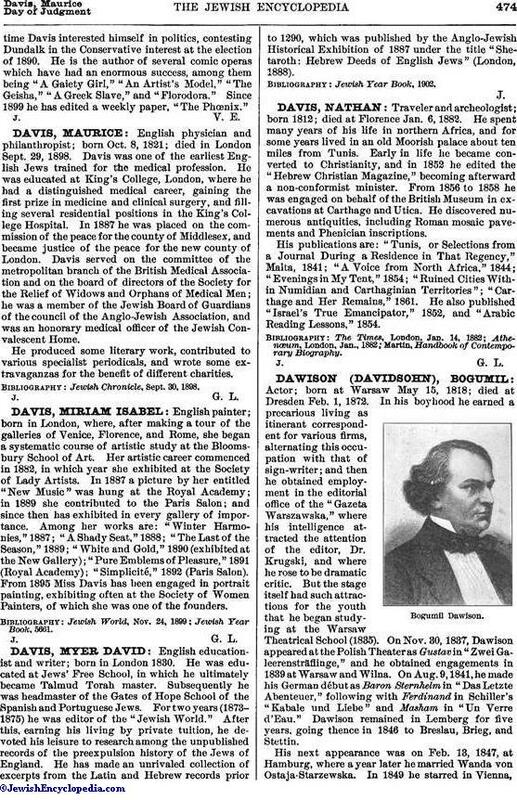 Davis served on the committee of the metropolitan branch of the British Medical Association and on the board of directors of the Society for the Relief of Widows and Orphans of Medical Men; he was a member of the Jewish Board of Guardians of the council of the Anglo-Jewish Association, and was an honorary medical officer of the Jewish Convalescent Home. He produced some literary work, contributed to various specialist periodicals, and wrote some extravaganzas for the benefit of different charities. Jewish Chronicle, Sept. 30, 1898.